You can easily try this exercise at home. No gym equipments needed. This regular exercise will let you strengthen up your body muscles. 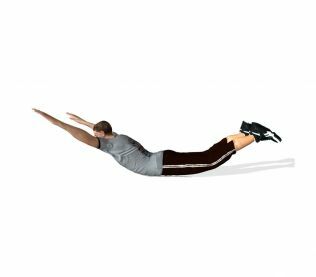 This exercise is a good way to improve the strength and endurance of your core, back muscles, and glutes without any gym equipments. 1. This is just a variation of the superman. Lie on the floor on your stomach with the arms extended out in front of you and the legs extended behind you. 2. Then, lift your arms and legs off the floor and hold it as long as you can.